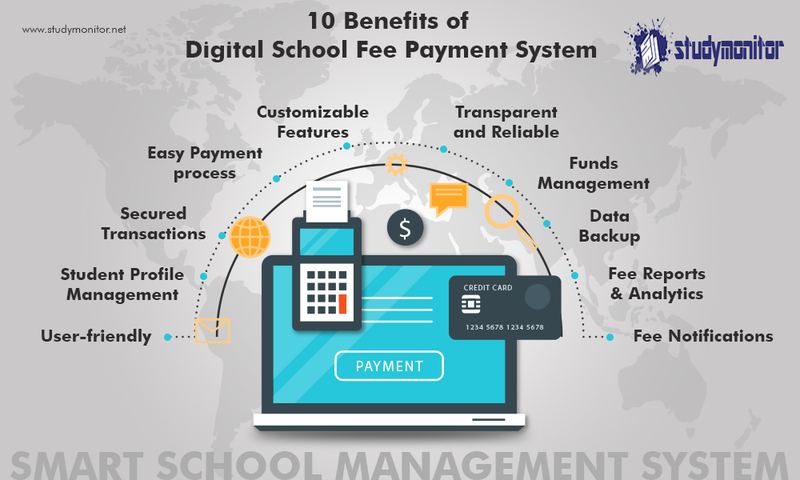 Manual fee collection is more liable to human errors, below are a good many reasons why schools should adopt the online fee payment method of collecting fees through cloud and mobile-based fee management system. Integrate automated fee management software into your school administration system in few easy steps and experience the comfort and ease of handling the secure and paperless platform. Create every student’s profile and quickly fill fields required like demographic data, parents or guardian’s details and emergency contacts. Drop fee details like admission, hostel, library, exam, and fee for extra activities also track receipts like Fees ledgers date-wise, month-wise, late fee depositors, defaulters list and the list of class fee structure. Choose software solution with which most of the payment gateways are pre-integrated. Even in the multi-user system, payment service providers follow complete application level security and compliance process making account management secure and convenient. Integration of fee management solution with administration system makes fee remittances faster. Pay school fees online with different payment options available such as debit card, credit card, net-banking, and e-payment either from a website or mobile. Hence experience hassle-free processing and automatic generation of school fee receipts. Digital fee payment system makes it possible for customisation of school fee categories as per school needs. Set various categories like 1) Sports, Transportation, Academic, and Exam fee 2) Annually, Half-Yearly, Quarterly, Monthly fee, etc. 3) Class wise fee, Late Fee and Optional fee etc. Set discounts like Merit-based discounts, add or edit fees, and collect fines with ease. Unauthorized and fraudulent practices are not permitted. With payment tracking system suspicious actions are traced allowing high-level transparency and improving cash management. Manage the Income raised for the school from donors, alumni, NGO’s and other organisations using the separate module. The cloud-based fee management system simplifies things and provides fast backup along with data synchronisation feature. Automate, simplify and deploy library database seamlessly to make it easy for your institution and to benefit from secure cloud services. The modern reporting system generates various school fee receipts and analytic reports on student ledger, date wise fees and outstanding fee payments further it keeps track of unpaid student details. Digital school fees payment system reminds students and parents about fee payments with auto-reminders, real-time notifications, emails, SMS alerts and mobile push notifications.